There has been enormous growth in the use of medical implants. However, in the case of hip replacement, loosening of metallic prosthesis fixed with polymethylmethylacrylate bone cement has resulted in painstaking revision surgery, which is a major problem for the patient, surgeon, and biomedical technology itself. In fact, global recognition of this problem led to the development of cementless fixation through the novel introduction of a bioactive hydroxyapatite (HAp) coating on biomedical-grade metallic implants. Since then, a wide variety of coating methods have evolved to make the HAp coatings on metallic implants more reliable. Shedding light on the future scope and possibilities of MIPS-HAp coatings, Microplasma Sprayed Hydroxyapatite Coatings provides a valuable reference for students, researchers, and practitioners of biomedical engineering and materials science. What Governs HAp Coating’s Performance? What Are General Guidelines to Improve Bonding Strength? Arjun Dey is a scientist in the Thermal Systems Group at the Indian Space Research Organisation Satellite Centre, Bangalore. Dr. Dey was previously at the Council of Scientific and Industrial Research-Central Glass and Ceramic Research Institute, Kolkata, India. He holds a bachelor's degree from Biju Patnaik University of Technology, Orissa, India, and master's and doctoral degrees from the Indian Institute of Engineering Science and Technology, Shibpur, Howrah (formerly Bengal Engineering and Science University). Highly decorated and widely published, Dr. Dey serves as a reviewer for many national and international journals. He recently coauthored the CRC Press book Nanoindentation of Brittle Solids with Dr. Mukhopadhyay. Anoop Kumar Mukhopadhyay is a chief scientist and head of the Advanced Mechanical and Materials Characterization Division of the Council of Scientific and Industrial Research (CSIR)-Central Glass and Ceramic Research Institute (CGCRI), Kolkata, India. Prior to joining CSIR-CGCRI, Dr. Mukhopadhyay initiated in India the research work on the evaluation, analysis, and microstructure mechanical properties correlation of non-oxide ceramics for high-temperature applications. He holds a bachelor's degree from Kalyani University, India, and master's and Ph.D degrees from Jadavpur University, Kolkata, India. Highly decorated and widely published, Dr. Mukhopadhyay holds seven patents, serves on the editorial board of Soft Nanoscience Letters, and recently coauthored the CRC Press book Nanoindentation of Brittle Solids with Dr. Dey. 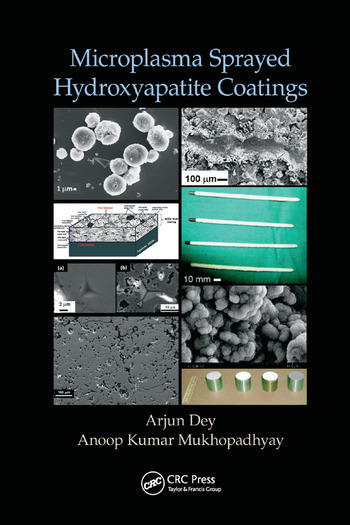 "This unique book on development of microplasma sprayed HAp coating has been organized in a very compact yet comprehensive manner. This book also highlights the horizons of future research that invites the attention of global community, particularly those in bio-medical materials and bio-medical engineering field. This book will surely act as a very useful reference material for both graduate/post-graduate students and researchers in the field of biomedical, orthopedic and manufacturing engineering and research. I truly believ that this is the first ever effort which covers almost all the broad subject area of "HAp coatings developed by microplasma spraying including those of the more commercially accepted plasma spraying method" for developing HAp coated implants and prosthesis." "The organization of topics is done very methodically covering all the related and even peripheral issues. The subject is covered well with thorough details and critical views. The book would be a good reference point for researchers working on HA based coatings for orthopedic application." "The lucid presentation style makes it easy for the new entrant to be gradually initiated into the field without any shock or jerk. What is most striking and appealing about the book is that even after starting from basic simple premises it has very capably provided vast and in-depth discussion to an extent that would be very lucrative for advanced researchers from both Govt. and private research organizations in the emerging field of biomedical applications of ceramic coatings."